This article is in 3 parts and covers a) upcoming trade reporting in the London gold market which is being led by the London Bullion Market Association (LBMA), b) the recent publication by the LBMA of a Guide to the London OTC precious metals markets, and c) an update on monthly vault reporting which the LBMA and the Bank of England launched in 2017. The lack of trade reporting in the London gold market is possibly one of the biggest ommissions in global financial markets, since the lack of gold trade data totally obscures knowledge of gold price discovery in a market that is predominantly a synthetic paper trading market, but which also plays hosts to the secretive world of central bank gold trading and central bank gold lending. Trade reporting in the London gold market is also an initiative which the London Bullion Market Association (LBMA) has been promising to establish for more than 3 years, but which as yet has not produced one scrap of gold trade data, as the launch date and publication dates for this trade reporting have been continually pushed out. In June 2014, in the wake of widespread trading misconduct, the UK Financial authorities launched the “Fair and Effective Markets Review” (FEMR) to improve confidence in the UK’s Fixed Income, Currency and Commodities (FICC) as well as to improve the fairness and efficiency of those markets. The Review was conducted by the Treasury, the Bank of England and the UK Financial Conduct Authority (FCA) with the help of an independent Market Practitioner Panel drawn from the financial sector. According to the FEMR, fair markets are those that have features such as market transparency and open access, while efficient markets are markets where trading and post-trade infrastructures provide sufficient liquidity and allow participants to discover and trade at competitive prices. While this statement sounds innocuous enough, in a case of trying to steer the FEMR agenda while making it appear to be fully in agreement, the LBMA submission letter also made it clear that its members wanted the “precious metals market” to “report anonymised unique transactional data”. The LBMA also cleverly retained control of the FEMR related agenda as it applied to the gold market when in April 2015 the LBMA launched its own “Strategic Review” of the London bullion market by commissioning the “independent” consultancy EY to undertake the actual strategic review and write a report. Although the LBMA at the time gave lip-service to transparency and said that it would engage with the global bullion market in shaping this strategic review, the reality was otherwise and, for example, this author’s request for engagement were ignored by the LBMA. Furthermore, the actual EY report and its recommendations were never published and even the well-connected Financial Times in October 2015 said that it had only “seen” a “copy of the recommendations”. What exactly the EY recommendations were is unclear, since the EY report was never published, but based on LBMA press releases, the goal of the review in terms of strategic objectives was said to be to enhance transparency, improve efficiency, and expand the use of technology in the gold and other precious metals markets. The following month in November 2015, the LBMA announced that it had received 17 responses from 20 providers to its RFI queries, and that it had reappointed EY to help evaluate these responses. Then on 4 February 2016 (i.e. exactly 2 years ago), the LBMA launched a Request for Proposals (RfP) process and asked a short-listed of 5 of the above 20 service providers to submit proposals to deliver a number of services to the London gold market including trade reporting, portfolio reconciliation and valuation curves, and also to build or provide infrastructure to support these services such as a submission interface, trade repository and data warehouse etc. These services, including trade reporting, would, according to the LBMA press release, “be launched later in 2016”, and more specifically had a “target delivery date in the second half of 2016”. But strangely, even though the LBMA said in February 2016 that it would launch trade reporting ‘later in 2016’, and even though the July 2016 FEMR noted that ‘trade reporting was a priority’, it was only on 12 October 2016 that the LBMA actually announced the winning entry in the RfP process. This winning entry was awarded to a joint bid by financial technology service providers Autilla and Cinnober’s Boat Services Ltd. On the same day, the LBMA pushed out the launch date of trade reporting even further into the future and said that “in the first quarter of 2017, the LBMA together with Boat…will launch a trade reporting service”. In this extremely long drawn out exercise by the LBMA, it must be clear by now that the LBMA and its trading members are engaging in this trade reporting project on their own terms, and with little regard for the spirit and recommendations of the Fair and Efficient Markets Review. There is also a trend of missed deadlines, broken promises, and a lack of explanation for the delays. Trade reporting data is being sent internally, analysed heavily, and filtered and scrubbed and sanitized. Nothing as yet has been published, and promised publication dates have been continually pushed out. The LBMA doesn’t even try to hide this, saying in one of its conference presentations that the “decision to publicise anonymous, aggregate data sits with LBMA and Member firms” and that it requires “a minimum of 3 months to analyse data and agree parameters for public deferral”. In all of this, gold investors of the world are getting the usual run around. The LBMA’s agenda for implementing trade reporting has far less to do with providing gold trade data to the investing public and the global gold market, and a lot more to do with influencing lobbying efforts with regulators and placating the woolly recommendations of soft touch regulators. If so, they should release all of this data, in granular format by category, showing for each metal, trade volumes by transaction type across spot, forward, options, deposits, loans and swaps. 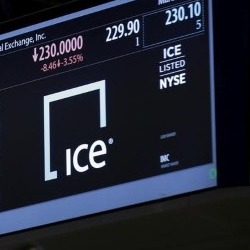 Transparency also calls for data that is useful for analysis, like the full suite of trade data that is reported by the world’s securities exchanges, where all trades would be reported, showing price, quantity, trade type (spot, option etc), transaction type (ETF, consignment etc), client counterparty types (central bank, broker, commercial bank, hedge fund, refinery, miner etc). So, yes, its possible that this information on the physical market can be reported. Technically there is nothing preventing this. But will it be reported? Likewise, will the trade data that is published reveal the magnitude of fractionally-backed unallocated gold trading that accounts for over 95% of daily London gold market turnover? Another area critical for trade reporting report is central bank gold trades and central bank gold lending and gold swap related trades. 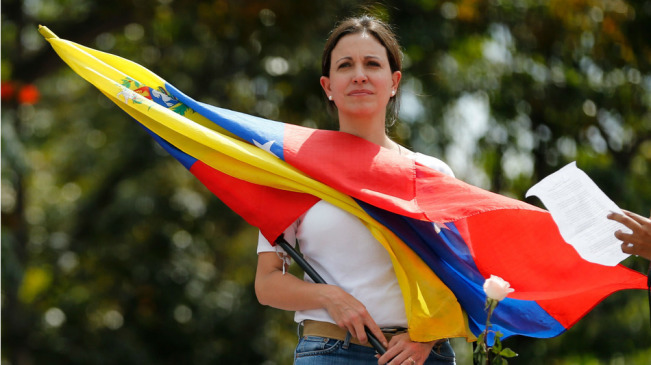 Will central bank trades be reported as a grouping? Highly unlikely, as the LBMA already said that “the role of the central banks in the bullion market may preclude ‘total’ transparency, at least at public level. But as I see it, almost none of the above will be reported by the LBMA, and the most we can expect per metal is a gross trade turnover figure rolled up by month, which is a figure that is practically useless in revealing anything about the real workings of trading in the London precious metals markets. In early November 2017, the LBMA published an updated “Guide to the Global OTC Precious Metals Market”. The guide in pdf format can be opened here. The relevant LBMA press release is here. 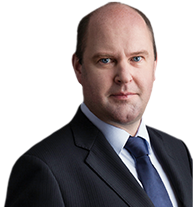 The guide is edited by Jonathan Spall, consultant to the LBMA, with input also from Aelred Connelly PR Officer to the LBMA. On first reading, although well presented, it becomes apparent that this new Guide does not contain very much new information at all, with most of the information in the guide either already on the LBMA website, or taken from other LBMA publications and tweaked slightly. More recent developments such as London vault reporting or the LBMA Gold Price are included, but only the type of content that was already in the associated LBMA press releases. 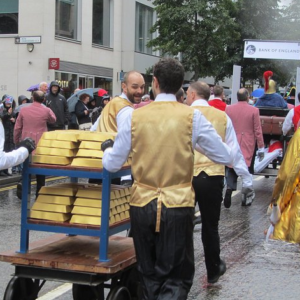 If you didn’t know anything about the London gold market, this guide might provide some introductory detail, but other than that, it’s like a standard reference text which would be found in a reference library. Unbelievably, this updated LBMA guide claims that it seeks to “make the moving parts of the market transparent”. However, in reality, it provides very little detail on transparency, so this claim rings hollow. There is nothing revealed in the guide as to how the market really works, who the influential players are, and no data that would reveal the real state of the market, i.e. 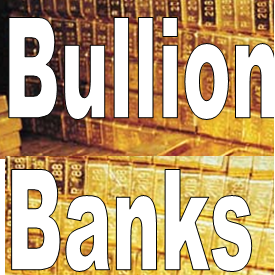 the fractional backing of unallocated accounts, the level of outstanding gold lending, the working of the gold vaults, how gold ETFs are allocated to and from what sources they are allocated from, how the Bank of England interacts with the commercial bullion banks and its client central banks, the trading volumes in the market and what transaction types they refer to etc. This is a pity and a missed opportunity, since if it wanted to, the LBMA could have revealed how the moving parts of the market really work. 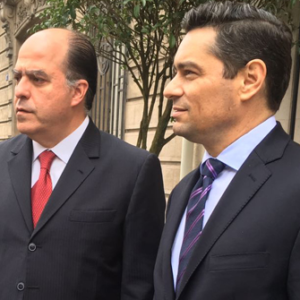 But it is not surprising, since in its public and media interactions, the LBMA essentially acts as gatekeeper, regulating and filtering the information that it allows to be disclosed about the London gold market. Excluding the introduction and appendices, there are 22 sections in the guide. As well as gold and silver, the guide also covers the London Platinum and Palladium Market (LPPM), and the good delivery system for platinum and palladium. 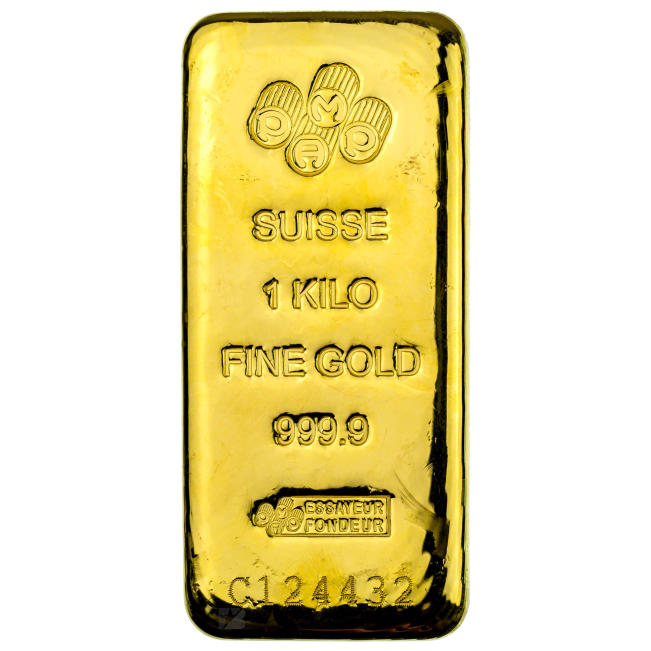 This section has short discussions of things like characteristics of the price (troy ounce, fineness etc), that are mostly taken from a page on the LBMA web site. Most importantly, this section does nothing to illuminate important questions about ‘price discovery’ or ‘where does the internationally quoted gold price come from?’. There is nothing in this section about price discovery or that the prices on COMEX and the London OTC market create the international gold price. COMEX is mentioned elsewhere in the guide not in relation to price discovery. However, this paragraph fails to mention that these are fractionally-backed unallocated positions, and that the position in the account with a clearing bank is a synthetic cash-settled gold derivative and really not backed by gold. The ‘backed by metal held in a vault in London’ is therefore misleading and disingenuous, since there is not necessarily any gold backing an ‘account held with a clearing bank’. 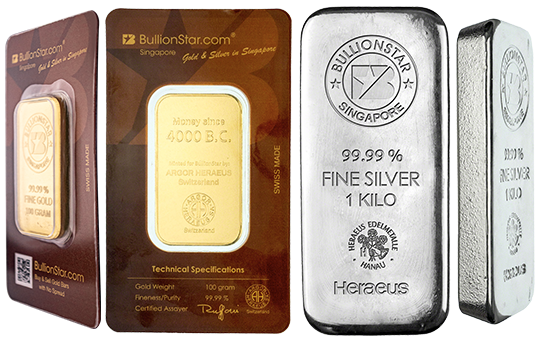 “Clearly, gold, silver, platinum and palladium are all traded metals. It is an important distinction that it is not unallocated or allocated metal that is traded, but the metal itself. This section could have actually provided real detail in LPMCL. But it didn’t. It just takes some text from the LPMCL website. The LPMCL subsection also has no explanation of the AURUM system and the fact that it its unallocated metal that is being cleared. In fact, this entire LPMCL section is misleading because the section is titled “London Precious Metals Clearing Limited” and apart from a few introductory paragraphs about LMPCL, the rest of the section is devoted to physical gold vaulting, with sub-section headings such as” Vault Managers”, “Vault Operators Accreditation Scheme”, “Weighing Gold”, “Weighing Silver”, “Traditional Weighing”, “Weighing Platinum and Palladium”, “Scales”. 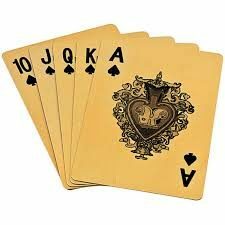 But clearing of paper transfers (which LPMCL’s AURUM processes) is not related to vaulting of physical metal. Allocating metal is distinct from the clearing of trades in AURUM. It’s a separate step. Notably, this section also doesn’t mention who the member banks of LPMCL are. They are HSBC, JP Morgan, Scotia, ICBC Standard, and UBS. Could it be trying to draw attention away from the names (the bullion banks) that actually run the LBMA? Given that the LPMCL website definition of unallocated metal is an “amount of that Precious Metal which we have a contractual obligation to transfer to you”, the “metal not the account” statement above makes little sense and is illogical. The first subsection of section 9 is titled “Deposits and Leases”, but there is no mention that bullion banks predominantly do the borrowing or that the central banks predominantly do the lending, nor of the level of outstanding loans from central banks to bullion banks. As of July 2017, it has been calculated by the World Gold Council (using data from the International Monetary Fund’s International Financial Statistics) that the world’s central banks hold 33,399.2 tonnes of gold. A listing appears in section 22. But the question must be asked, why does the LBMA need to resort to quoting figures from the WGC which are in turn just figures reported to the IMF when the LBMA can get lending info from its member firms about gold lending activity, and from the Bank of England. This subsection also states that central banks lends to commercial banks. 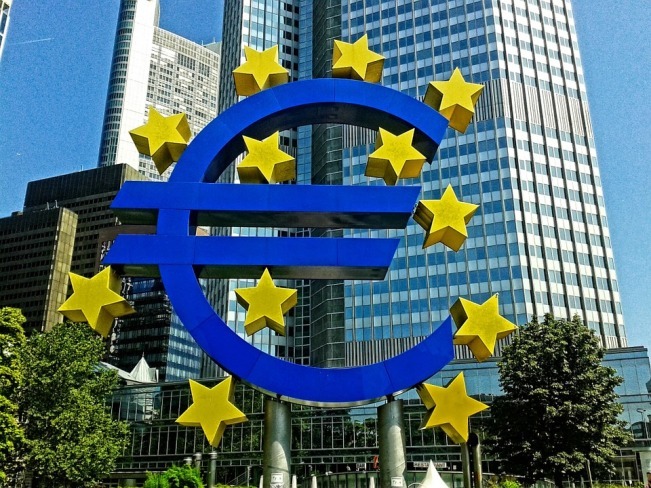 But there is no mention of which central banks and commercial banks are involved, or the level of gold lending by central, or the length of deposits, or whether they roll over the loans and for how long. “Therefore, allocated metal becomes unallocated when it is lent but can be returned as allocated. Albeit, it will be returned with different bars and will likely be of a (slightly) different weight. 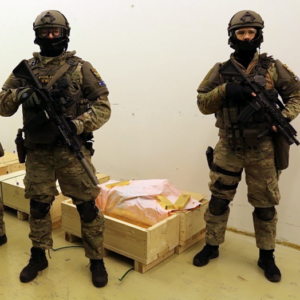 There is nothing new in this section, and only vague references of how central banks in the London gold market lend and swap gold with bullion banks. This section is as good as blank given that there are no gold market trade statistics. This page just gives some sketchy information about the delayed gold trade reporting project (see above). For such a promising sounding section, based on the title, this section is a real letdown and has nothing in it except a short introduction followed by a replicated table of World Official Gold Holdings sourced from the World Gold Council. This new updated LBMA Guide is in some ways similar to a ‘Limited Hangout’ as the term is used in the intelligence community, i.e. 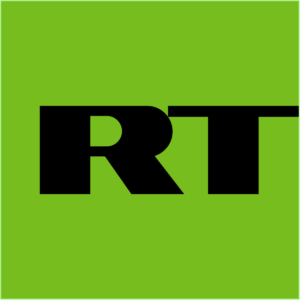 revealing partial truth while keeping the main body of information hidden, and acting as gatekeeper to drip feed some information. In other words, some information is ‘hung out’ while the main body of information is kept hidden. The public see the information that is offered and thinks “this is useful, this source is credible” but then the public inquires no further. The LBMA can point to the fact it is ‘transparent’ about the gold market, while actually not revealing anything at all important about the real workings of said market. The LBMA has drip fed some information to the public while actually acting as gatekeeper and preventing any critical information from reaching the market. One of the characteristics of a limited hangout is that nothing new is really revealed about the subject matter being discussed. This is exactly what the LBMA guide is. All of the information contained in the guide is already on the LBMA website or else within LBMA press releases. There is also a failure to discuss the most important areas of the London Gold Market including the fractional reserve nature of unallocated gold accounts, what the daily gigantic trade volumes in gold and silver are based on, how the London OTC gold market that trades huge quantities of synthetic gold positions continues to set the international gold price, the extent of gold lending in the London market and who are the lending central banks and who are the borrowing bullion banks, the real role of the Bank of England in the London market and the lending market, how the LMPCL clearers maintain gold accounts at the Bank of England. This goes back to the theme of transparency and secrecy that I discussed in a presentation in Singapore October 2016 titled “The Gold Market – Where Transparency means Secrecy”, a transcript of which can be read here. This also relates to the topic of market efficiency and availability of market data and information. Because, a market which is secretive and which is not transparent, such as the London Gold Market, cannot be efficient, because some market participants, namely bullion banks and central banks, have an informational advantage over other participants. And remember that the London Gold Market creates the international gold price, so the transparency of this market is not just a theoretical issue, it has real world implications for everyone who owns and transacts in physical gold around the world. Last year in 2017, both the Bank of England and the London Bullion Market Association (LBMA) for the first time began publishing monthly data showing the quantities of physical gold and silver held in the wholesale precious metals vaults in London. The Bank of England data covers monthly gold holdings held by its central bank and commercial customers in the Bank of England’s gold vaults. Note that the bank of England does not store any silver. The LBMA publishes monthly data on both the gold and silver held in the vaults of the 8 commercial vault operators which comprise its vaulting network. Both sets of data are published on a 3-month lagged basis. The Bank of England began to independently publish its monthly gold vault data at the end of the first quarter 2017, and the first month’s figures for the end of December 2016 revealed that the Bank’s gold vaults held 5102 tonnes of gold. 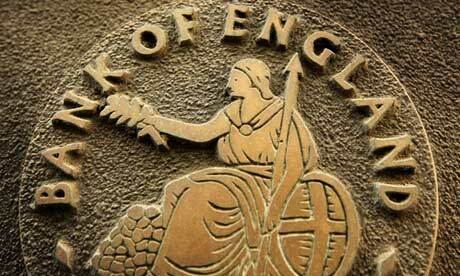 See “Bank of England releases new data on its gold vault holdings” for more details. Prior to 2017, the Bank only published gold vault holdings data once a year in its annual report. The LBMA began publishing its vault data at the end of July 2017. Prior to that the LBMA had never published any data addressing precious metals holdings in its London vaulting network. When the LBMA published its first set of data at the end of July, it stated that as of 31 March 2017 there were 7449 tonnes of gold and 32078 tonnes of silver in the vaults of the 8 commercial vault operators that comprise its vaulting network. See “LBMA Gold Vault Data – How low is the London Gold Float?” from 2 august 2017 for more details. For some reason, the first set of LBMA was on a 4-month lagged basis, however, since then they have since caught up to reporting on a 3-month lagged basis. Since it’s now 6 months since the LBMA first released its vault data, it’s timely to do a short update on the more recently published vault data from both the LBMA and the bank of England, starting from the end of March 2017. At the end of March 2017, the Bank of England was storing 5081 tonnes of gold in the vaults under its headquarters building in London. As of September 2017 (the latest month published), the Bank of England was storing 5220 tonnes of gold. 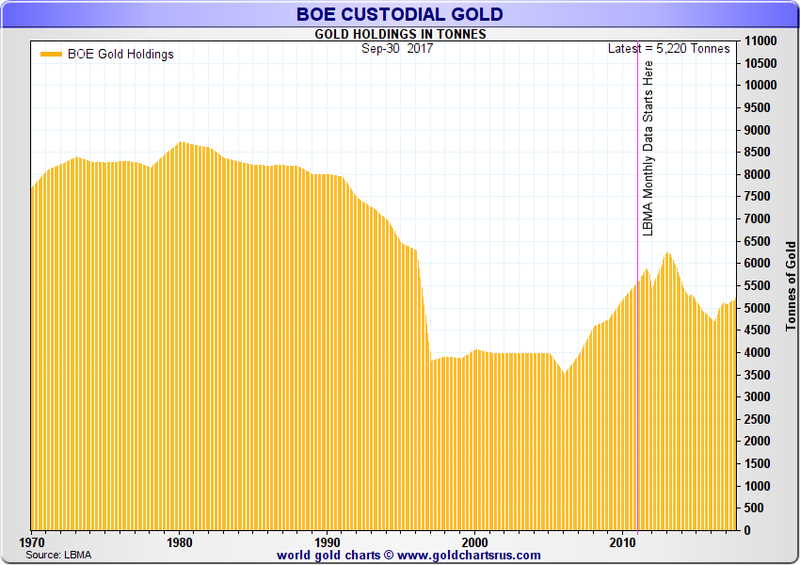 Therefore in that 6 month period, net gold holdings in the Bank of England’s vaults increased by 139 tonnes, or 2.73%. There were net additions of gold to the Bank’s vaults in 5 of those 6 months, but nothing really significant stands out. A net 43 tonnes were added in April, 33 tonnes in June, there was a net decline of 8 tonnes in July, and a net addition of 56 tonnes in September. See chart below for a graphical representation of these Bank of England vault holdings changes. Over the 6 month period from month-end March 2017 to month-end September 2017, the LBMA precious metals vaults saw a net inflow of 294 tonnes of gold, or a 3.95% increase. There were net additions over the same 5 months as the Bank of England witnessed. 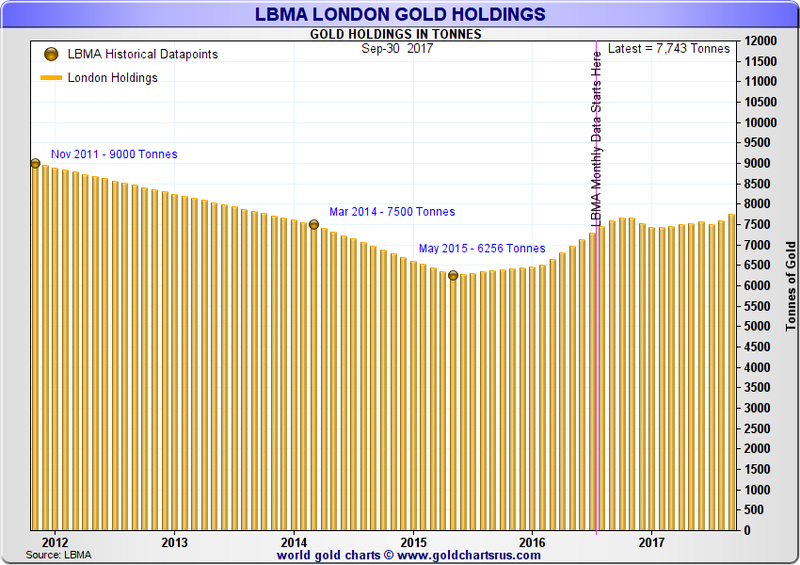 On an aggregate basis, total gold holdings rose from 7449 tonnes to 7743 tonnes with large net inflows of gold bars appearing in the LBMA vaults in April with 47 tonnes added, 45 tonnes added in June, 86 tonnes added in August, and September saw the highest inflow with 157 tonnes of gold added. 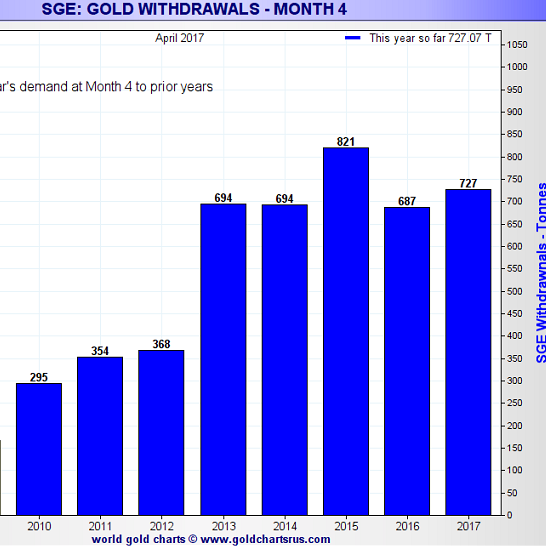 Only July 2017 saw net outflows of 59 tonnes of gold bars. 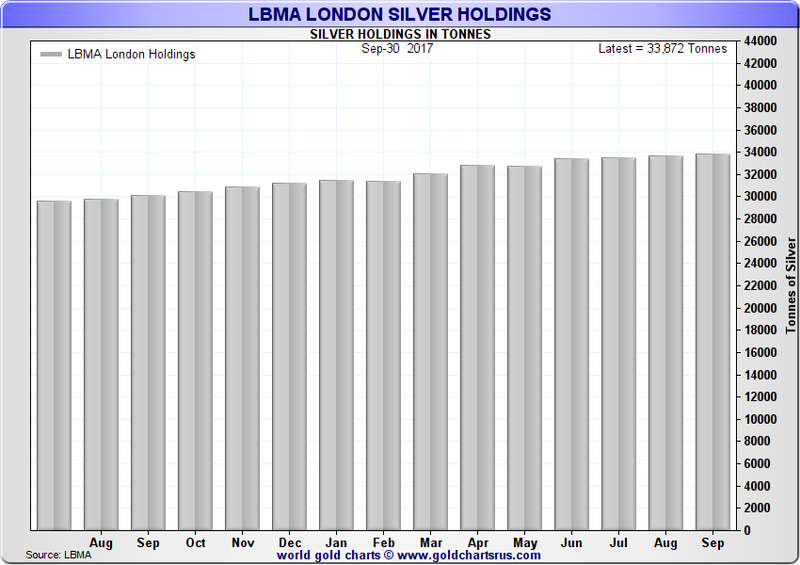 See chart below for changes to these LBMA vault holdings totals. Adding the gold inflows of 294 tonnes in the LBMA vaults to the gold inflows of 139 tonnes in the Bank of England vaults, this means that over the 6 month period being discussed, the total amount of gold stored in all the London wholesale gold vaults increased by 433 tonnes, which is the equivalent of just under 35,000 Good Delivery gold bars, each weighing approximately 400 ounces. Gold-backed ETFs which store their gold in London only added about a net 40 tonnes of gold over the same period, so could only explain a small part of the total increase. The LBMA vaults on an aggregated basis added 1794 tonnes of silver over the same 6 month period to the end of September 2017. Total silver holdings rose from 32078 tonnes to 33873 tonnes. 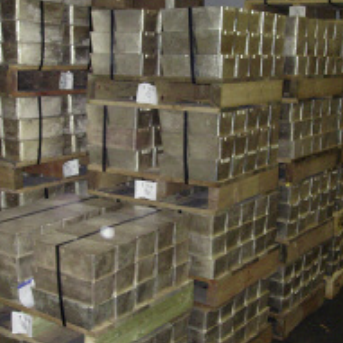 This was a net increase of 5.6% in the total silver quantity held in the vaults. The largest net inflows were in April with 749 tonnes added, and June with 658 tonnes of silver added. Silver-backed ETFs which hold their silver in London actually saw net outflows over the 6 month period in question, so these movements do not explain the large 1794 tonnes of silver added to the London vaults over this time.